Darts players at the Half Moon pub in Lawford Road are celebrating becoming national champions. The Admiral Tavern Darts Championships is an annual national event hosted by Admiral Taverns and includes pub darts teams from right across the community pub operator’s estate of 850 establishments. These stretch from Manchester all the way down to Brighton. The teams are competing for the winner’s trophy and a cash prize of £1,000. This year is the first time that licencee Mark Sutton has achieved the victory. Mark has been running the Half Moon - which has always been a darts-orientated pub with numerous competitive teams - for just four months. 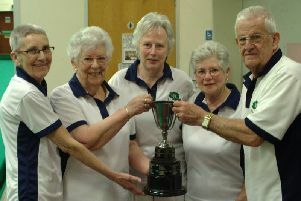 In this year’s competition the Half Moon had to beat teams from Coventry and West Bromich to secure their place the grand finals in Manchester. Once there the Rugby team came up against a tough team from Liverpool and lost the first two four-a-side games. Once back into the singles’ the Moon gathered pace and took the lead 4-2 with wins from Prakash Jiwa, Louis Barbarian and Gareth Braham, before Darren Swords held his nerve to complete the job 6-3 and put them into the semi-final. There, the Half Moon came up against the 2017 champions in the Railway pub from Helsby. This time they drew the four-a-side 1-1. This was a tough close game as the Railway kept fighting back, with the scoreline going 2-2, 3-3, 4-4 before Darren Swords stepped in to make it 5-4 and captain Mark Sutton held his nerve to win it 6-4 and put the Moon into the final for the first time. Once in the final the Half Moon faced the three times champions the Strawberry Gardens from Manchester. The Rugby team took a 2-0 lead, winning both four-a-side games. But Strawberry Gardens stepped in and took the next three games to take a 3-2 lead. It was then Dean Sanders, Gareth Braham, Adam Paxton put the Half Moon 5-3 up. Next, up went Darren Swords throwing for the match but came across an in-form Strawberry Gardens player, who hit a 14-dart leg to peg the scoreline back to 5-4. It was all down to the captain Mark Sutton, who held his nerve in the final to finish the game off to win the competition. As a result the players from the Half Moon received £1,000 cash, the annual trophy and the opportunity to host an exhibition with a top 16 PDC darts player. Delighted captain Mark Sutton said: “This is a great achievement for the lads and for Rugby darts. To win a competition like this for Rugby is fantastic. “The lads played well all tournament and deserved to be walking away as champions. We have played some very tough games in this competition with teams and darts getting better and better each year.